"I've seen a figure, I think, of 62%, which is the high proportion of cycling KSIs [Killed or Seriously Injured incidents] that are associated with some infraction by the cyclists themselves of the rules of the road"
Last week the Guardian and the London Cycling Campaign analysed claims by the freshly re-elected Mayor of London Boris Johnson during one of his first grillings by the London Assembly. The Mayor implied that a significant majority of cyclists - almost two thirds - are implicated in incidents of fatalities and serious injuries (KSI) on the roads. However he was criticised for having no solid evidence for the claim. It is not immediately clear whether Boris is referring to London's roads alone or if he is taking a national picture, however statistics for either are available. Taking the national picutre, the Department for Transport (DfT) provides statistics in its Annual Report of reported road casualities in 2010. The best available indicator of 'cyclist infraction' is the 'Contributory Factor' associated with road accidents. These are measured only in accidents attended by a police officer, and then only if that officer chooses to record the factor. "The contributory factors system has been developed to provide some insight into why and how road accidents occur. Contributory factors are designed to give the key actions and failures that led directly to the actual impact to aid investigation of how accidents might be prevented. The factors are largely subjective, reflecting the opinion of the reporting police officer, and are not necessarily the result of extensive investigation. Some factors are less likely to be recorded since evidence may not be available after the event. While this information is valuable in helping to identify ways of improving safety, care should be taken in its interpretation." The accident numbers shown here only include accidents which were attended by a police officer - such accidents accounted for 81 per cent of all accidents in 2010. In addition, accidents where no contributory factor was recorded were also excluded, although this accounts for just 3 per cent of the 2010 total. 11,929 incidents involving cyclists were included - accounting for two-thirds of all bike accidents in 2010. Of these, 48 per cent did not record a contributory factor as a reason for the accident. From this, we can conclude that 52 per cent of bikes involved in accidents contributed in some way towards the incident. This compares favourably to other modes of transport - 65 per cent of motorcycles were in some way implicated, compared to 59 per cent for cars. Buses and coaches came off slightly better with an implication rate of 49 per cent. Again, these statistics are based on rapid assessments after the incidents rather than extensive reports, as the DfT admits. They even concede some of the judgements may be due to police preconceptions about certain vehicle user groups. But what about deaths and serious injuries? Unfortunately the DfT doesn't break these figures down into the Killed and Serious Injury (KSI) rate. However data is available from the Transport Research Laboratory (TRL), who conducted a study in 2009 looking directly at the causes of collisions involving pedal cyclists on the roads from 2005 to 2007. According to TRL, between 2005 and 2007 there were a total of 7,366 cyclist casualties resulting in death or serious injury. 83 per cent of these were as a result of a collision with another vehicle. 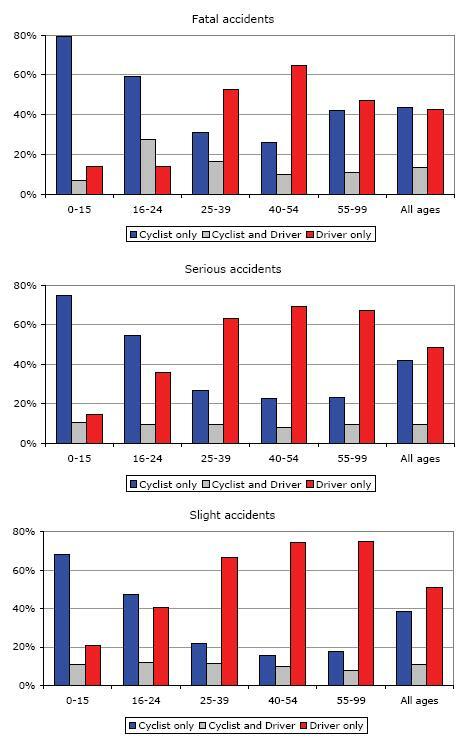 The data suggests that younger cyclists tend to be labelled more as a contributory factor than older cyclists, which the report makes clear could mean either that younger cyclists behave more dangerously or that police tend to bias their recording towards implicating young cyclists. Overall the data indicates that, in one-on-one collisions, drivers and cyclists broadly share the blame in those involving deaths and the most serious injuries, while drivers are more implicated in slight accidents. So we can say from the data that around half of all KSI accidents involving one cyclist and one vehicle were attributed in some part to the cyclist - although some of these cases also implicated the driver. It should be emphasised however that the contributory factor assignments do not necessarily mean that the driver or cyclist implicated was responsible for the accident, as the TRL point out. Is the case any different for London? Taking the London situation alone, statistics on cyclist casualites are compiled by Transport for London, most recently found in a factsheet from 2011 in which data is provided for all casulaties registered in 2010. 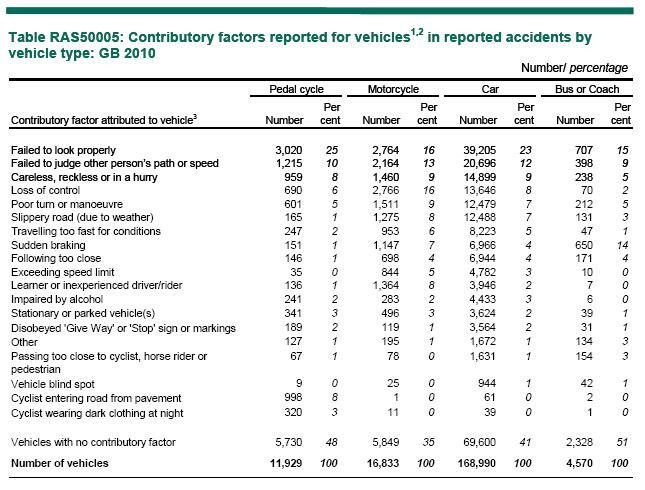 However, like the DfT figures no specific data is provided for KSI casualties - instead, the sheet lists the top 20 contributory factors assigned to cyclists and drivers and how many times these were listed. This data shows that drivers made a total of 7,856 errors contributing to accidents involving cyclist injury in 2010, compared to 3,368 instances of cyclist contribution. However there were only around 4,000 casualties in total during 2010. This is because, as we've seen, several errors can contribute to a single accident. For example, a driver could be both impaired by alcohol and exceeding the speed limit when the accident occured. So we cannot reliably use these figures to suggest that drivers are implicated on substantially more occasions than cyclists. It is very difficult to find any way of substantiating Boris Johnson's 62 per cent figure. The Guardian reported that the Mayor obtained his figure from a member of the public, so there is obvious difficulty in verifying where the statistic comes from. The best available research, from the Transport Research Laboratory, indicates that around half of all one-on-one collisions involving a cyclist were attributed in some part to the cyclist, although this does not imply the cyclist was responsible for the accident. National figures from the DfT - more recently for 2010 - also show around half of all accidents involve a contribution from the cyclist.